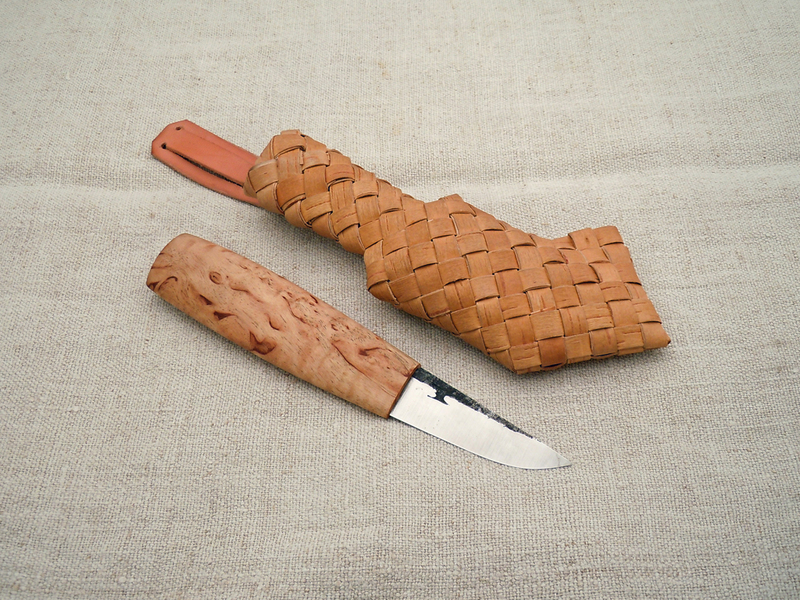 My search for information about birch bark sheaths, tuohituppi, led me to a maker by the name of Eero Kovanen in Turku, Finland. I wanted to find out what he knew about birch bark harvesting, preparation and fabricating. Eero responded to my inquiry and we’re working on a two part post where he’ll discuss the tupohituppi in depth. 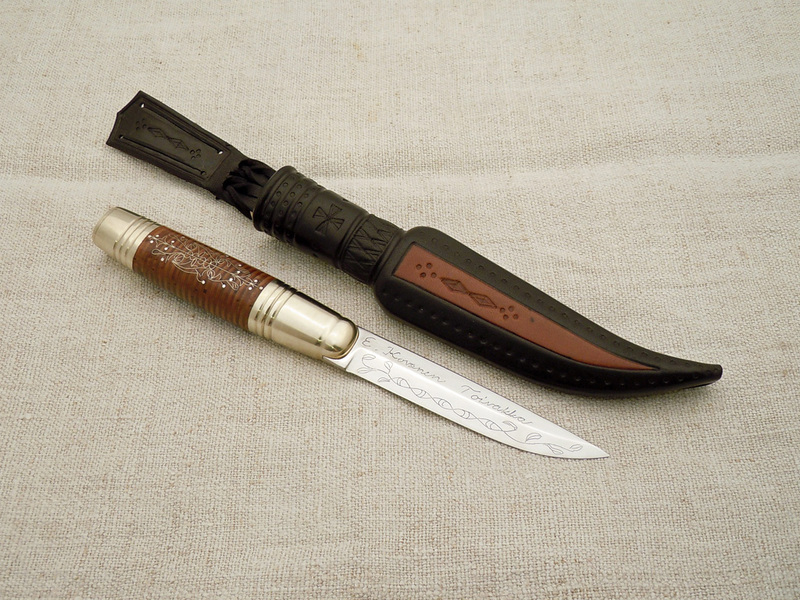 I really like these sheaths but I don’t see them that often. 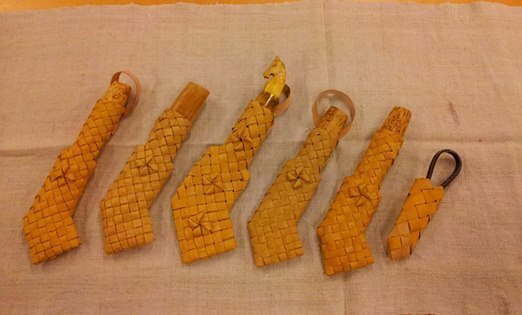 I think they are a traditional craft that should be revived. As Eero pointed out to me birch bark is a very tough, resilient and flexible material and has been used for many purposes in Finland. We’ll discuss that in the next post or two, in the meantime I would like to show some of Eero’s puukkos as well as a short interview I did with him. When and how did you become interested in puukko? 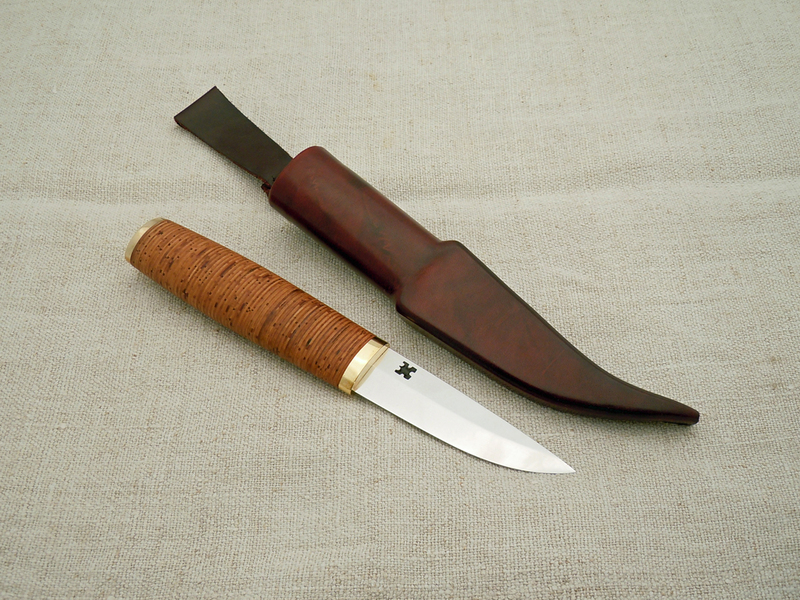 -I grew up in the countryside and used puukko as a kid. Also I used a peeling iron, axe and other cutting tools. How did you get started as a puukkoseppä? 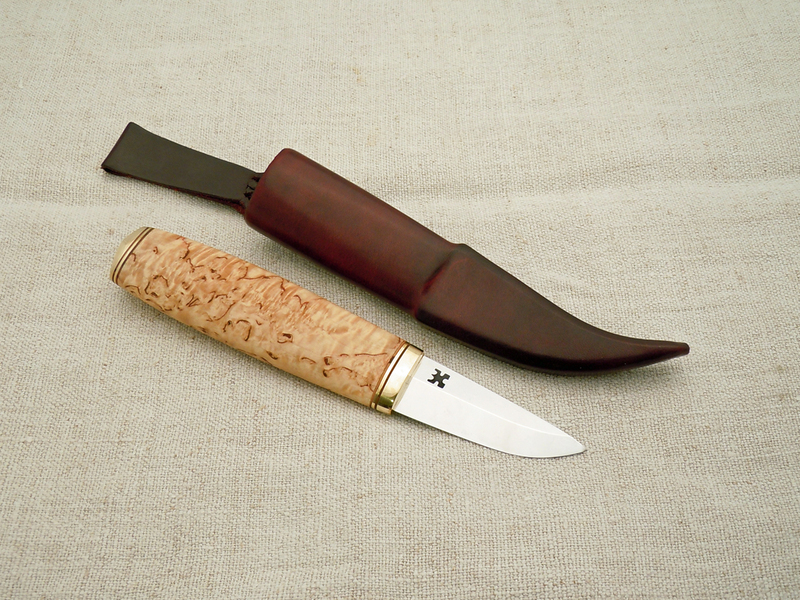 -I made my first puukko at the age of 16, my friend gave me parts for puukko and I tried to make one out of those parts. When I finished that one it was so interesting that I ordered some blades from re-sellers and built a few more puukkos. For a few years I made puukkos from factory made blades and then I wanted to try forging. My first blade was a total failure, I had no idea how to do heat treatment. I read some books about blade making and made an ok blade. To learn more I went to a forging course and learned basic forging technique there. Slowly I learned making blades and after that I have been doing everything myself. Who and what were your influences? – I have been doing handcraft all my life. My parents are both skilled at handwork, my father is good with wood and my mother with knitting etc. In my home village lived an old man who did woodworking and birch bark products. I learned birch bark techniques from him and I’ve been learning more from books. I don’t think I’ve had any strong influence in puukkos from anyone in particular. For long time I did puukkos all by myself and just did what felt good. Are you self taught or schooled, how did you learn the skills? 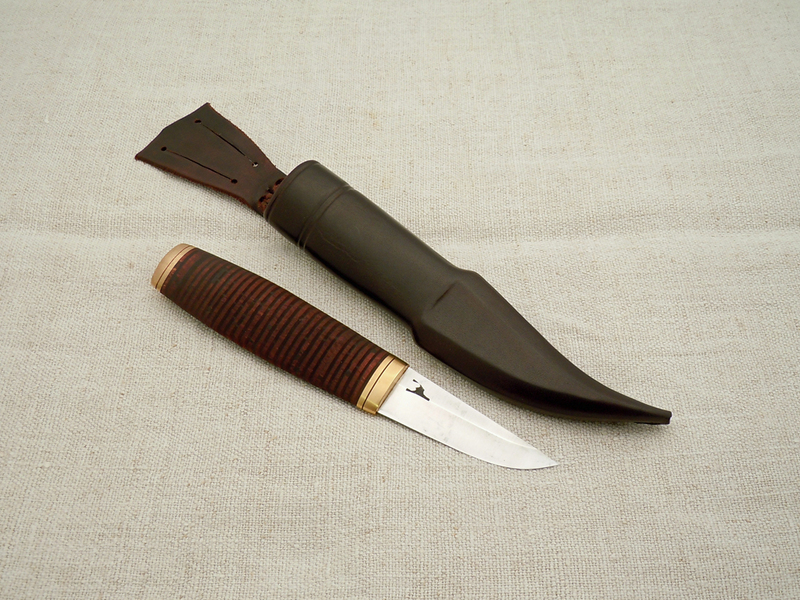 What’s your favorite type of puukko? 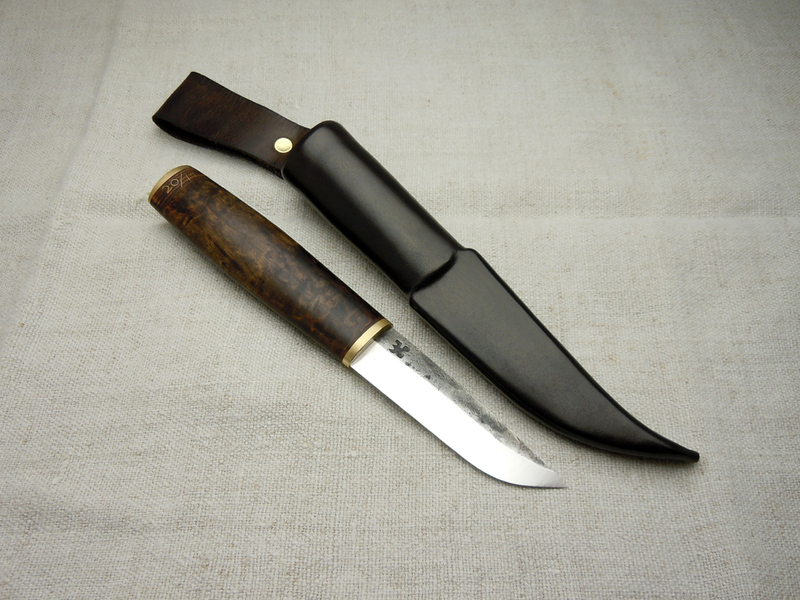 – All my blades are carbon steel, handles are usually curly birch or birch bark. Sheath materials leather and birch bark. Fittings brass or aluminum. I’ve made puukkos from rare materials too, but those are my basics. 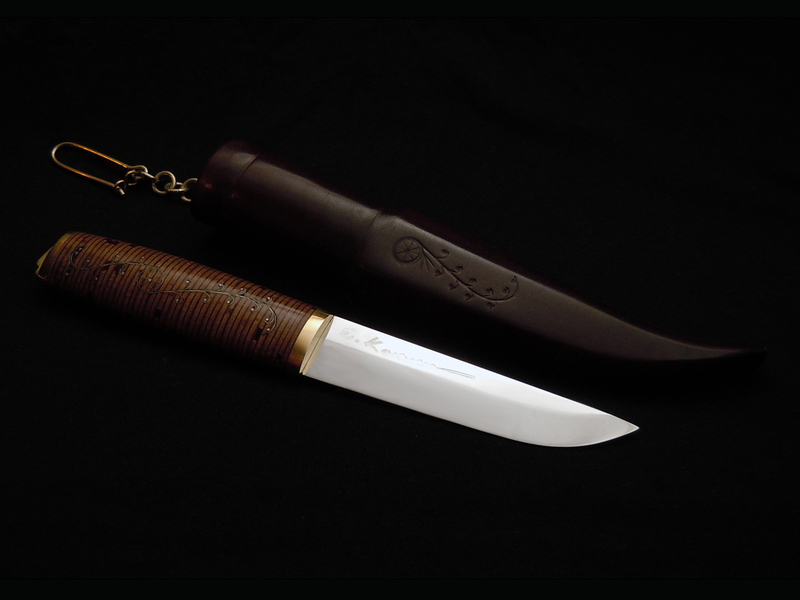 Do you have a favorite puukko that you use often? 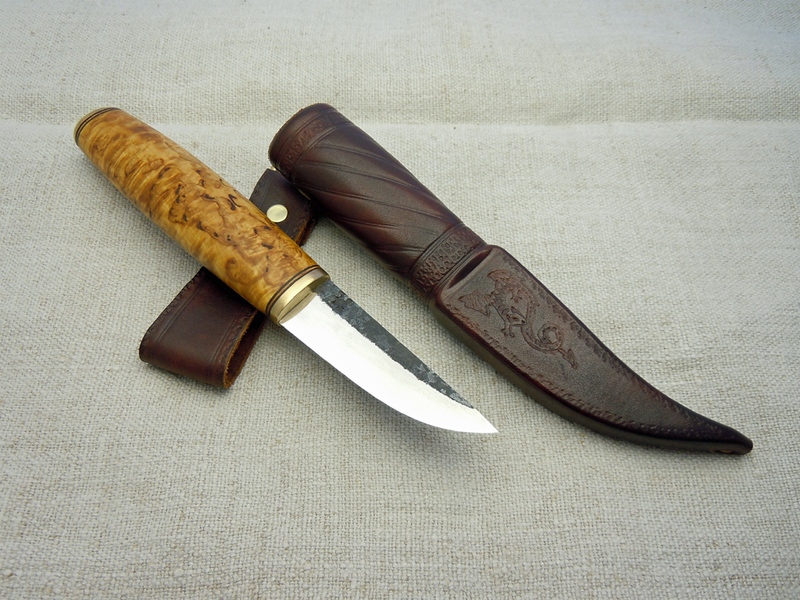 -Here is my favourite puukko. One that I thought was not good enough to be sold so I kept it for my own use. 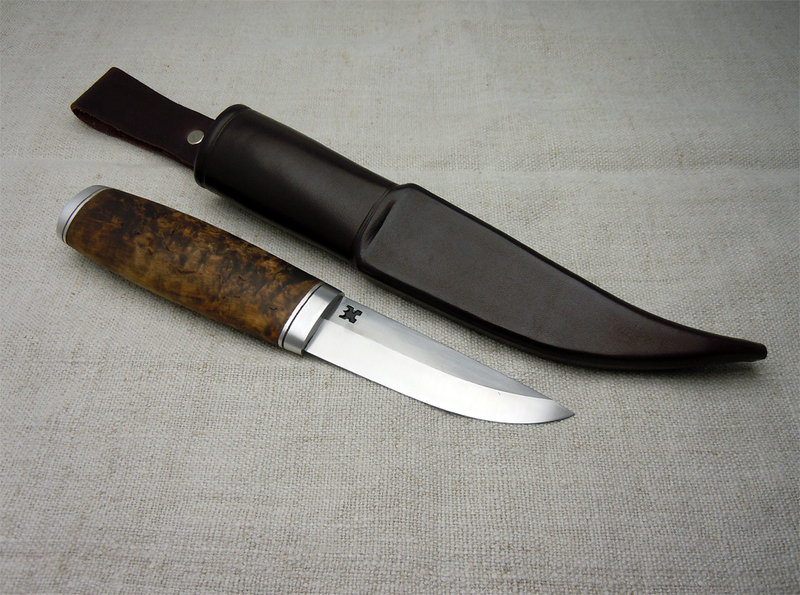 It was some time without sheath and then I wove a birch bark sheath for it. 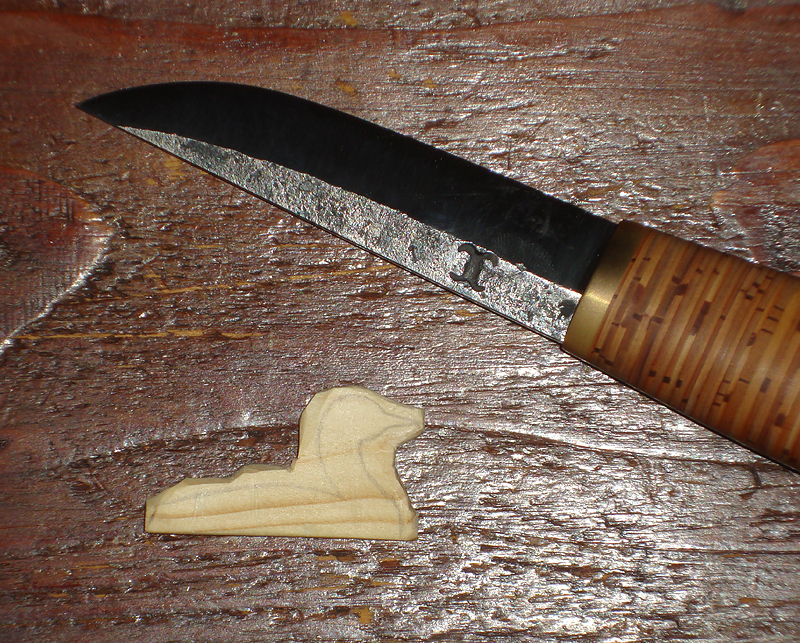 After that it’s been my number one puukko. It’s not pretty but it is just nice shape and size for me. 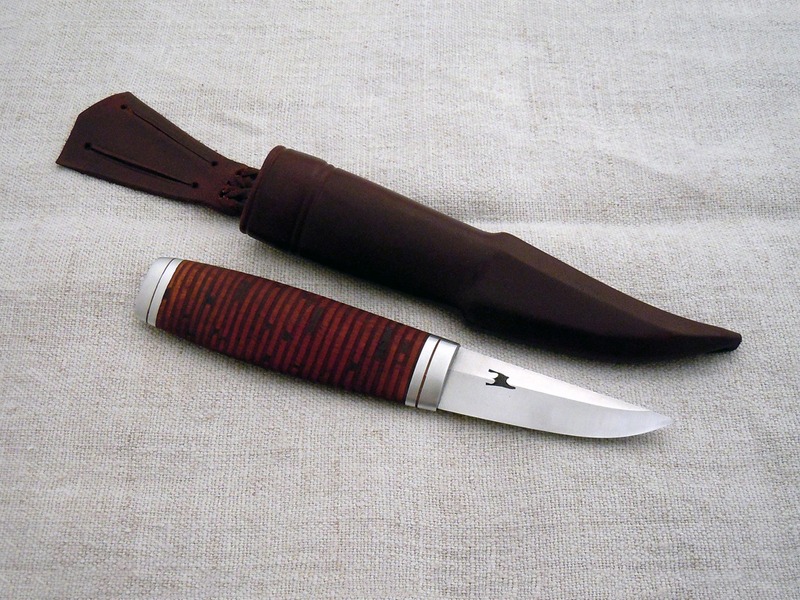 Do you have a “philosophy” about puukko design? – KEEP IT SIMPLE. Every puukko is made to use. – Traditional Finnish handwork, fishing, especially ice-fishing. I was the Scandinavian champion in 2008. 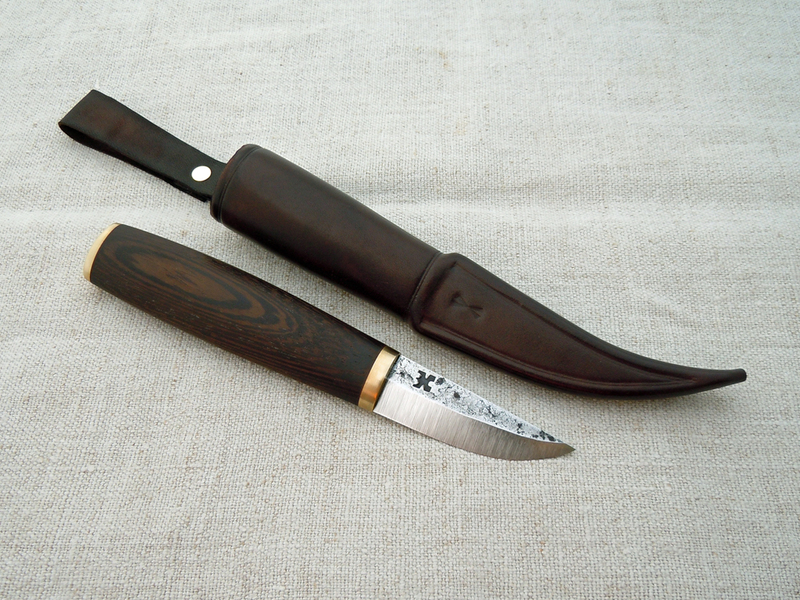 This puukko was hand made by Finnish blacksmith and craftsman Pasi Hurttila, native of Ulvila, but now living and working in Ivalo, 30 km from Lake Inari. Before dedicating himself to full-time blacksmithing he has been a wilderness guide for 10 years around Lappland and is still an eager hunter. 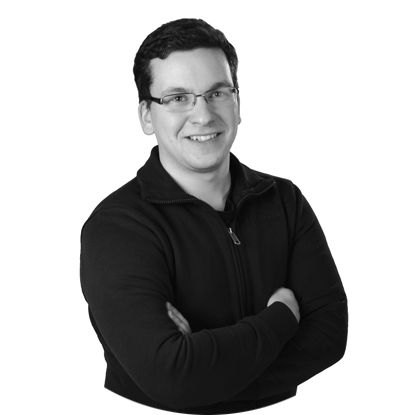 In his own words his goal is: “to craft effective tools, not microscope proof knives”. In addition to knives he forges all kinds of iron objects: from a nail to a railing. All the measurements I’ll give are just of this specimen and have to be taken just for it. 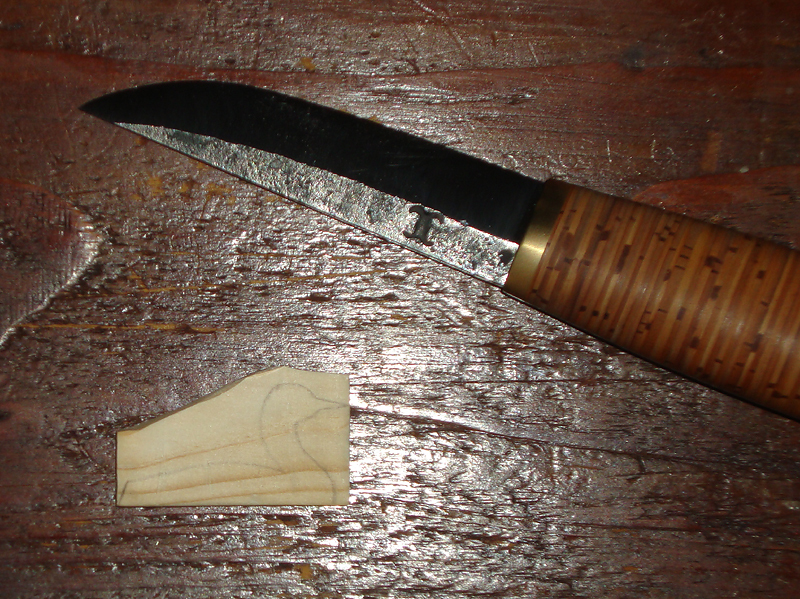 Since every puukko is individually made measurements will change slightly. The knife comes simply enveloped in a paper sheet. 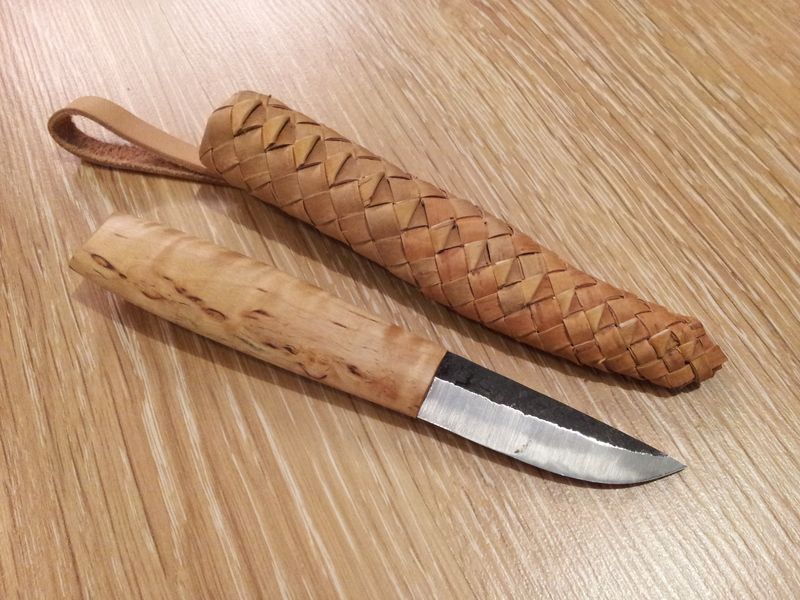 The name Tuohipää means birch bark handle.The rhombic section blade was forged with a hand held hammer from Böhler K510, or “silversteel”, the European equivalent of Japanese Aogami “blue steel”. Out of the box it was hair popping sharp.The heat treatment was made completely on the open fire of the charcoal forge by following the changing of the steel colour. 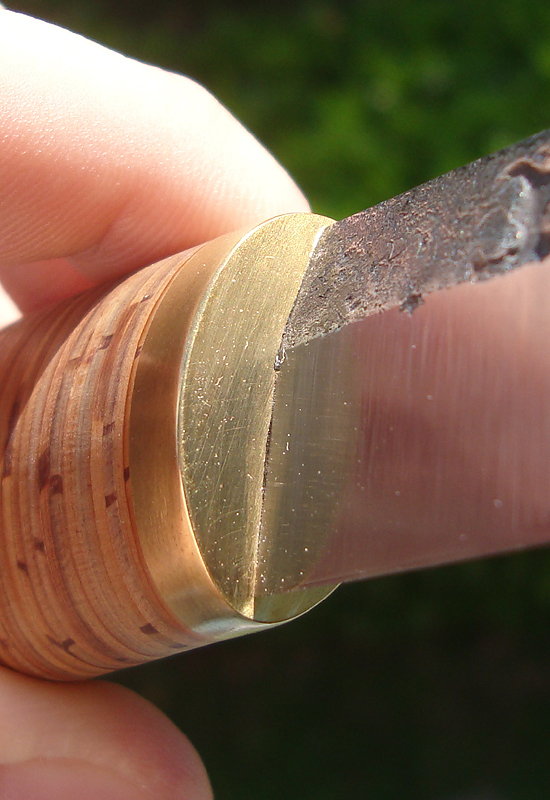 After annealing and normalization the blade gets a partial oil quenching followed by two temperings. As I have already said in previous reviews, birch bark, naturally filled with essential oil, is waterproof and almost neutral towards shrinking from humidity changes. It’s texture provides a very firm grip whatever hands are tired, bloody or moist and gives always a warm feeling. 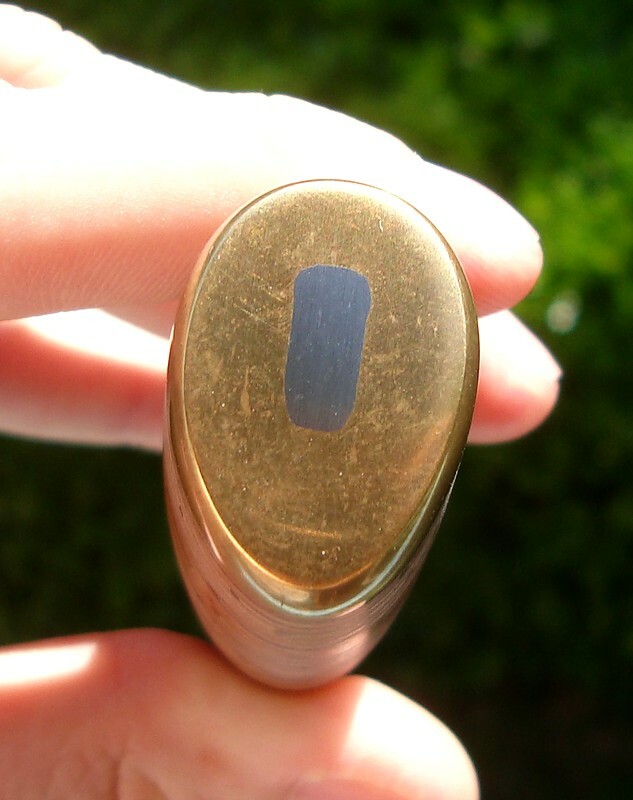 The handle has a quite marked teardrop cross section. 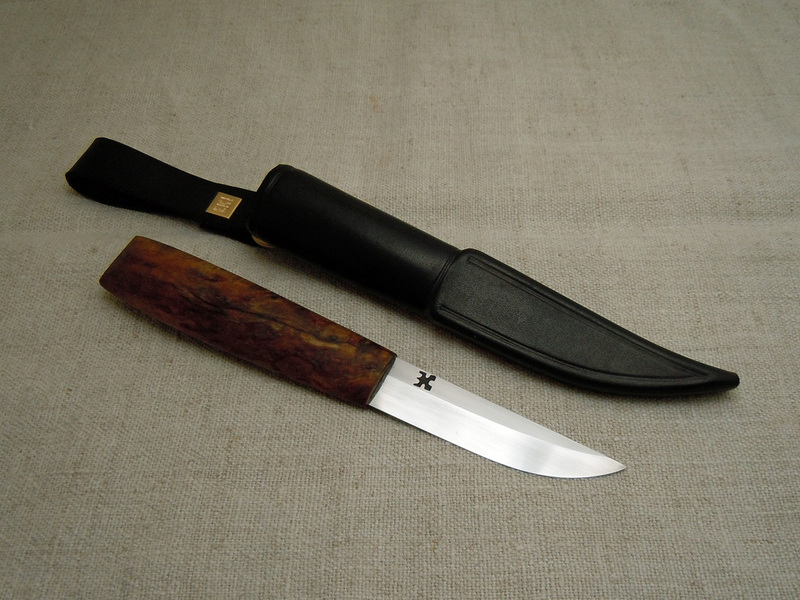 The sheath was hand stitched from 2 mm thick cowhide and the leather of the mouth is folded inside so to increase the friction retention.It has a two sided birch protective liner, which was carved with this same puukko and a chisel. The belt loop is attached with a triangular D-ring allowing great steadiness during walking but also leaving to the sheath the possibility to be easily moved away when needed. 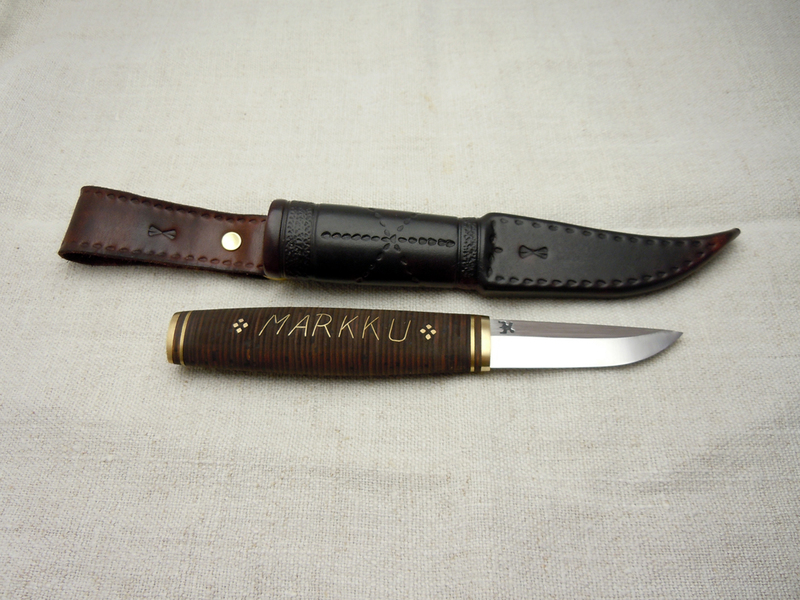 The only ready made part of this puukko is the brass button that closes the belt loop. 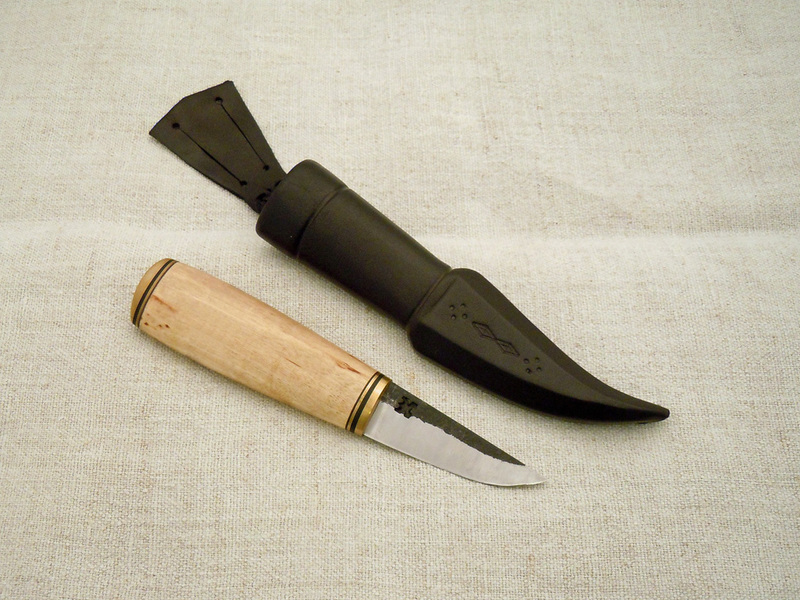 As stated the puukko alone weights 140 g, just a hair less than the Fällkiven F1. 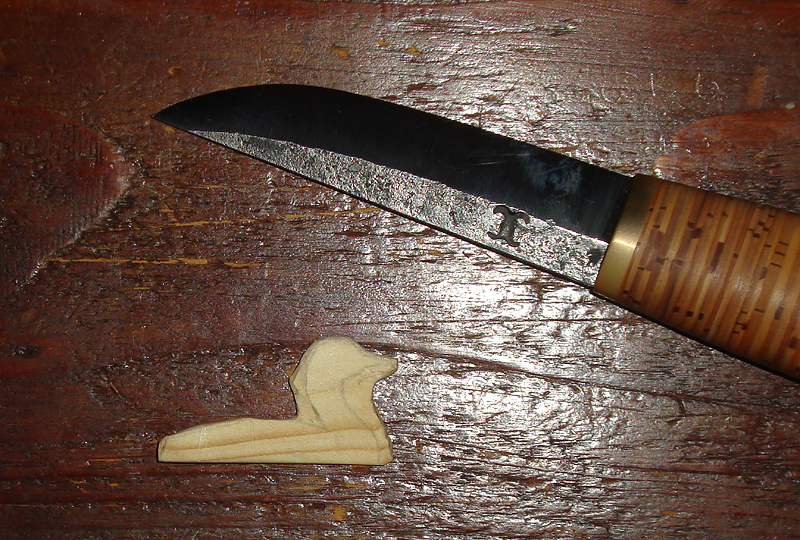 That’s not really light for a puukko, nevertheless, it’s still light enough on the belt and in the hand. 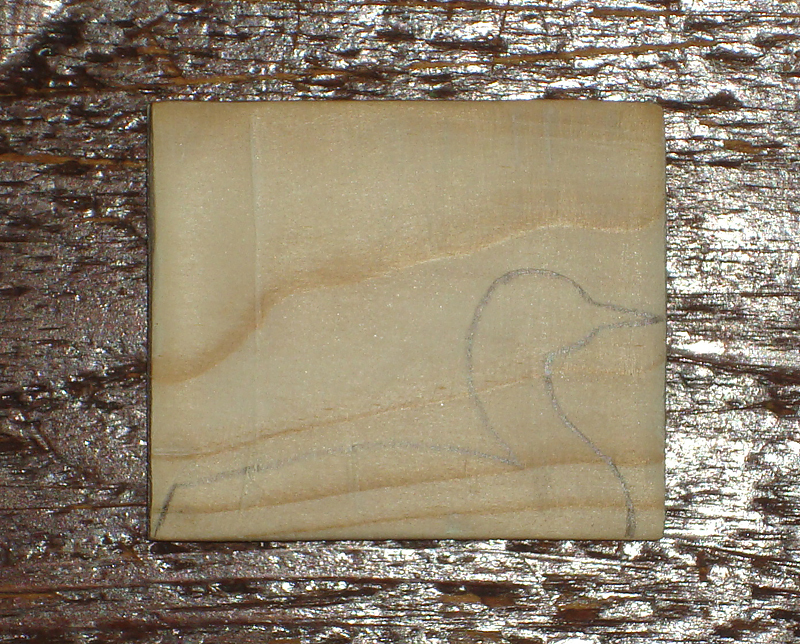 Keeping up the usual bird carving, this time I’ll do an arctic loon which, together with the red-throated loon, regularly nests around Lake Inari. Now, I saw another piece from our four years seasoned oak and draw the bird shape. I then shave the upper side of the block and cut wood chips so to get nearer and rough out the back of the loon, I rough hew the throat too, then I carve the head and the neck. I finish by refining the throat. Generally the loon was slightly trickier to carve than the goldeneye, especially due to the very small surface I could grip on to hold the work piece during the head carving. No comfort problems were detectable all throughout the two and a half hours this work took me. 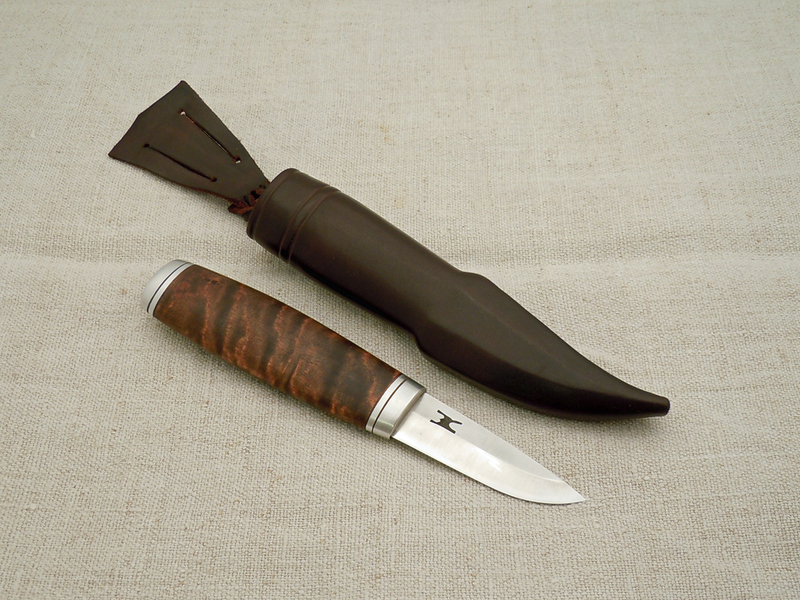 The handle teardrop section, compared to the more hand filling oval one, gives to the knife increased agility and fluidity of control, while still leaving good substance to the handle. The blade always kept a uniform bite “style” and a good agility in the tiny spaces of the loon back/neck junction, despite its width and almost absent taper. Due to its microbevel, just a hair bigger than the Malinen Koivumäki’s one, I noticed a bite just a little less deep, compensated by a slightly higher control over the wood quantity to be cut. 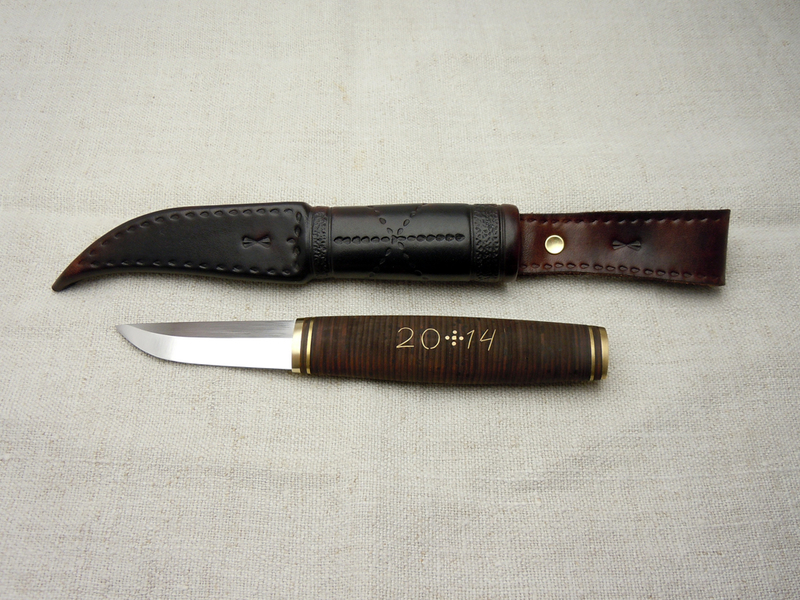 This is actually noticeable if you have both puukko to compare. At the end of all the edge was absolutely perfect and still shaved hair with just a little pressure.